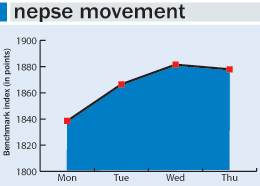 KATHMANDU, Mar 5: Nepal Stock Exchange (Nepse) index took a dive of 41.56 points, or 3.09 percent, to close at 1,304.43 points on Sunday. Stocks were in a freefall from the early trading hour as investors seemed to be in a rush to offload their shares in the downward market. The steep decline of stocks in recent days follows the appointment of Yubaraj Khatiwada as the new finance minister. Many say that the new finance minister views secondary market as an unproductive sector. In an interview with BBC Nepali Service last week, Khatiwada had indirectly reiterated his stance that the share market was an unproductive sector. Asked about the current liquidity problem, he had said that the government can bring capital from international market to address the liquidity problem while adding that there was no point of mobilizing the capital if the fund again goes back to the real estate, share market and auto sectors. The recent statements of the new finance minister have sent jitters among investors. The stock market, after reaching to a record high in 2016 following the decision of the Nepal Rastra Bank (NRB) to raise the minimum paid-up capital requirement for bank and financial institutions by multiple times, has been on a downward trend ever since with some occasional rises. The rise in interest rates of BFIs since last year has been driving stocks down. The decision of two main communist parties to form 'left-alliance' in the parliamentary and provincial elections and agreement to unify the party has also made investors nervous. The appointment of former NRB Governor Khatiwada has been the latest reason that has made the investors nervous, sending stocks prices downward. Stockbrokers say that the investors, afraid of bearish market, are selling their shares anticipating further drop in value of their securities. All trading groups ended in the red zone on Sunday. Insurance group fell by the highest 286.2 points to close at 6,391.15 points. A total of 1.31 million units of shares of 151 companies worth Rs 483.97 million were traded in the market on the day through 5,943 transactions. Only Suryodaya Laghubitta Bittiya Sanstha Ltd and Swadeshi Laghubitta Bittiya Sanstha Ltd saw their share prices went up on the day.